Cowabunga, DUDE! Here we go, for all that missed last years OG colourway they are back in full force. REALxHEAD x Unbox Industries presents the alternative colourway of the RXH X TMNT. This weekend will be your biggest chance of owning the set (or individually) ” 2017 saw the first release of Unbox’s collaboration with one of the soft vinyl genres true mavericks, Mori Katsura (aka REALxHEAD) & the legendary TMNT franchise. 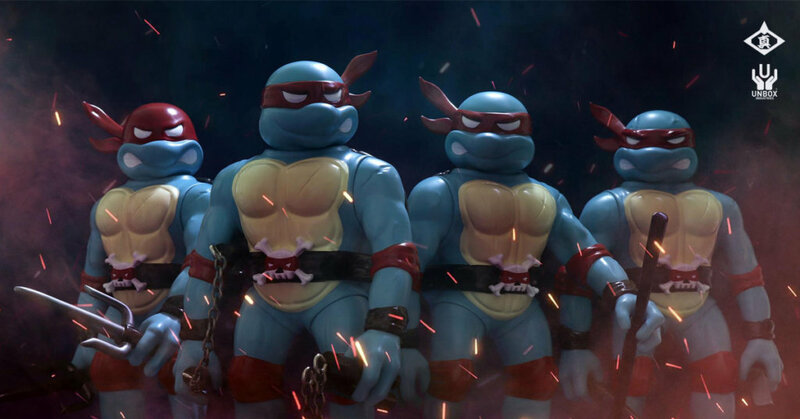 If you are wondering why all red bandanas, these are based off the original comic where all turtles wore red. TMNT holds a special place in the heart of Mori San & we are proud that we could produce his unique interpretation with the official blessing of Nickelodeon. Now in 2018 we are proud to offer a brand new colorway overseen by RXH and approved by the TMNT creative team. Not only that, we are offering a timed limited pre-order which should mean most fans will have the opportunity to own these very special figures. Fingers crossed Unbox will have separate colour bandanas for the TMNT set in future releases. For now, the city is safe with this pre-order.